Mexican authorities investigating the disappearance of 43 student teachers in Guerrero state have arrested a further 10 municipal police officers. Around 90 people in total, including 58 police officer, have been detained so far. 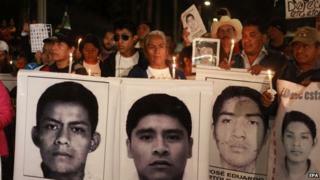 The students disappeared in September after clashes with police in the city of Iguala. National prosecutors say police handed them to criminal gangs who murdered them and burnt their bodies. Parents of the students dispute this, arguing the authorities are hiding what happened to them. The remains of only one student, Alexander Mora, have been identified so far. They were found near a rubbish dump where criminal gang members say the students were taken to be shot and their bodies burnt. Members of the gang said they killed the 43 and burned their bodies after they were told the students belonged to a rival gang. The relatives of the other 42 missing students say they will not give up hope of finding them alive until forensic evidence proves they are dead. The slow pace of the initial investigation into their disappearance and the collusion it has highlighted between local authorities and drug gangs has led to mass protests across Mexico.